Paul Pogba is revelling in the opportunity to play alongside the likes of Kylian Mbappe and Marcus Rashford, whom he believes are the "future of football". 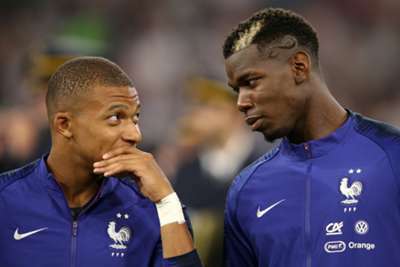 Both Pogba and Mbappe were instrumental in France's triumphant World Cup campaign in Russia last year, and the pair are set to feature as Les Bleus kick off their Euro 2020 qualifiers against Moldova on Friday. Rashford and Pogba were two players who appeared to struggle the most under Jose Mourinho's Manchester United management at the start of this season, but with interim boss Ole Gunnar Solskjaer at the helm the duo have thrived, revitalising what had been a stuttering campaign. "It helps me because they're both fast," he told Eurosport. "They call for the ball a lot, which helps me when I have the ball. "They call for it, I try to make the best pass and they finish - so it benefits me. "I like playing with young, talented players like them. They are the future of football and my partnership with them is good." "After the World Cup, there was another picture of me. I tried to show another side to myself...a more responsible person, who is professional," he added. "I wasn't against the media. I just thought it was useless to speak out against them. "I spoke with the coach [Didier Deschamps] before the World Cup. He told me I have to be more open. I'm a frank person and sometimes it isn't too good to talk, but now I am a little more open. "Now there is a new image that stands out, where I can express myself more."